Acetaminophen and codeine phosphate is supplied in tablet form for oral administration. In addition, each Acetaminophen and Codeine Phosphate Tablet USP contains the following inactive ingredients: crospovidone, magnesium stearate, microcrystalline cellulose, povidone, pregelatinized starch, stearic acid. Codeine â€“ Codeine is readily absorbed from the gastrointestinal tract. It is rapidly distributed from the intravascular spaces to the various body tissues, with preferential uptake by parenchymatous organs such as the liver, spleen and kidney. Codeine crosses the blood-brain barrier, and is found in fetal tissue and breast milk. The plasma concentration does not correlate with brain concentration or relief of pain; however, codeine is not bound to plasma proteins and does not accumulate in body tissues. Acetaminophen â€“ Acetaminophen is rapidly absorbed from the gastrointestinal tract and is distributed throughout most body tissues. The plasma half-life is 1.25 to 3 hours, but may be increased by liver damage and following overdosage. Elimination of acetaminophen is principally by liver metabolism (conjugation) and subsequent renal excretion of metabolites. Approximately 85% of an oral dose appears in the urine within 24 hours of administration, most as the glucuronide conjugate, with small amounts of other conjugates and unchanged drug. There have been post-marketing reports of hypersensitivity and anaphylaxis associated with use of acetaminophen. Clinical signs included swelling of the face, mouth, and throat, respiratory distress, urticaria, rash, pruritus, and vomiting. There were infrequent reports of life-threatening anaphylaxis requiring emergency medical attention. Instruct patients to discontinue acetaminophen and codeine phosphate tablets USP immediately and seek medical care if they experience these symptoms. Do not prescribe acetaminophen and codeine phosphate tablets USP for patients with acetaminophen allergy. Acetaminophen and codeine phosphate tablets should be prescribed with caution in certain special risk patients, such as the elderly or debilitated, and those with severe impairment of renal or hepatic function, head injuries, elevated intracranial pressure, acute abdominal conditions, hypothyroidism, urethral stricture, Addison's disease, or prostatic hypertrophy. Ultra-rapid Metabolizers of Codeine - Some individuals may be ultra-rapid metabolizers due to a specific CYP2D6*2x2 genotype. These individuals convert codeine into its active metabolite, morphine, more rapidly and completely than other people. This rapid conversion results in higher than expected serum morphine levels. Even at labeled dosage regiments, individuals who are ultra-rapid metabolizers may experience overdose symptoms such as extreme sleepiness, confusion or shallow breathing. When physicians prescribe codeine-containing drugs, they should choose the lowest effective dose for the shortest period of time and should inform their patients about these risks and the signs of morphine overdose (see PRECAUTIONS, Nursing Mothers). Do not take acetaminophen and codeine phosphate tablets USP if you are allergic to any of its ingredients. If you develop signs of allergy such as a rash or difficulty breathing stop taking acetaminophen and codeine phosphate tablets USP and contact your healthcare provider immediately. Codeine is habit-forming. Patients should take the drug only for as long as it is prescribed, in the amounts prescribed, and no more frequently than prescribed. This drug may enhance the effects of other narcotic analgesics, alcohol, general anesthetics, tranquilizers such as chlordiazepoxide, sedative-hypnotics, or other CNS depressants, causing increased CNS depression. 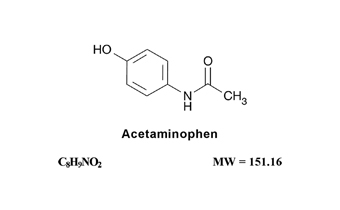 Acetaminophen may produce false positive test results for urinary 5-hydroxyindoleacetic acid. 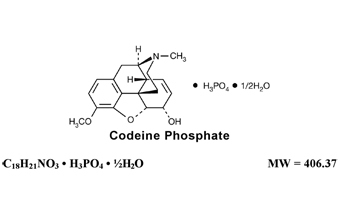 Codeine â€“ A study in rats and rabbits reported no teratogenic effect of codeine administered during the period of organogenesis in doses ranging from 5 to 120 mg/kg. In the rat, doses at the 120 mg/kg level, in the toxic range for the adult animal, were associated with an increase in embryo resorption at the time of implantation. In another study a single 100 mg/kg dose of codeine administered to pregnant mice reportedly resulted in delayed ossification in the offspring. The risk of infant exposure to codeine and morphine through breast milk should be weighed against the benefits of breastfeeding for both the mother and baby. Caution should be exercised when codeine is administered to a nursing woman. If a codeine containing product is selected, the lowest dose should be prescribed for the shortest period of time to achieve the desired clinical effect. Mothers using codeine should be informed about when to seek immediate medical care and how to identify the signs and symptoms of neonatal toxicity, such as drowsiness or sedation, difficulty breastfeeding, breathing difficulties, and decreased tone, in their baby. Nursing mothers who are ultra-rapid metabolizers may also experience overdose symptoms such as extreme sleepiness, confusion or shallow breathing. Prescribers should closely monitor mother-infant pairs and notify treating pediatricians about the use of codeine during breastfeeding (see PRECAUTIONS, General, Ultra-rapid Metabolizers of Codeine). The most frequently reported adverse reactions are drowsiness, lightheadedness, dizziness, sedation, shortness of breath, nausea and vomiting. These effects seem to be more prominent in ambulatory than in non-ambulatory patients, and some of these adverse reactions may be alleviated if the patient lies down. Other adverse reactions include allergic reactions, euphoria, dysphoria, constipation, abdominal pain, pruritus, rash, thrombocytopenia, agranulocytosis. Toxicity from codeine poisoning includes the opioid triad of pinpoint pupils, depression of respiration, and loss of consciousness. Convulsions may occur. In acetaminophen overdosage, dose-dependent, potentially fatal hepatic necrosis is the most serious adverse effect. Renal tubular necrosis, hypoglycemic coma and coagulation defects may also occur. Early symptoms following a potentially hepatotoxic overdose may include nausea, vomiting, diaphoresis and general malaise. Clinical and laboratory evidence of hepatic toxicity may not be apparent until 48 to 72 hours post-ingestion. A single or multiple drug overdose with acetaminophen and codeine is a potentially lethal polydrug overdose, and consultation with a regional poison control center is recommended. Immediate treatment includes support of cardiorespiratory function and measures to reduce drug absorption. Oxygen, intravenous fluids, vasopressors, and other supportive measures should be employed as indicated. Assisted or controlled ventilation should also be considered. For respiratory depression due to overdosage or unusual sensitivity to codeine, parenteral naloxone is a specific and effective antagonist. Each Acetaminophen and Codeine Phosphate Tablet USP 300 mg/15 mg tablet contains acetaminophen 300 mg and codeine phosphate 15 mg. It is available as a round, white to off-white tablet debossed with "2" on one side and an on the other side. Each Acetaminophen and Codeine Phosphate Tablet USP 300 mg/30 mg tablet contains acetaminophen 300 mg and codeine phosphate 30 mg. It is available as a round, white to off-white tablet debossed with "3" on one side and an on the other side. Each Acetaminophen and Codeine Phosphate Tablet USP 300 mg/60 mg tablet contains acetaminophen 300 mg and codeine phosphate 60 mg. It is available as a round, white to off-white tablet debossed with "4" on one side and an on the other side. is a trademark of Mallinckrodt Inc. This package is not for household use.